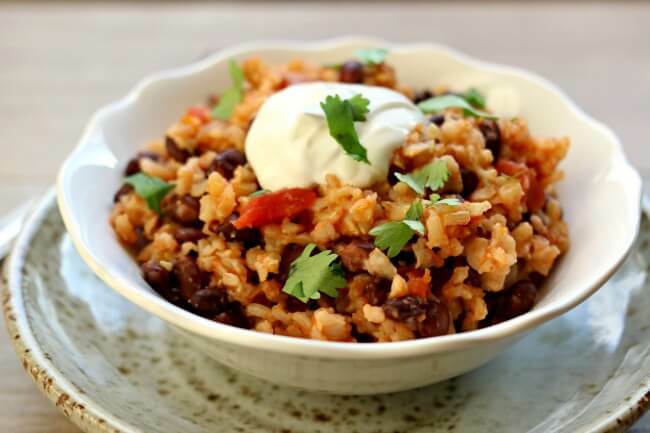 First off I want to say that I’ve been making the slow cooker version of these rice and beans for years and I love it so very much. I love to eat it for dinner or lunch or for a snack. I am training for a marathon right now and I had to run my longest run yet yesterday…20 miles. It was very taxing (to say the least). The only thing I felt like eating when I got home were these Mexican black beans and rice! I hobbled around the kitchen and threw everything into the Instant Pot and then took a shower. When I was done getting ready I hobbled back to the kitchen and scooped myself a bowl with a big dollop of sour cream. YUM! Recovery food. That’s what I like to call it. Oh and when my kids got home from school they ate the rest of it and then I made a second batch so we’d have leftovers for today. This is an inexpensive but filling (and somewhat healthy) way to feed your family! It only takes about 40 minutes from start to finish in the Instant Pot and if you decided to use white rice the time would be significantly less. 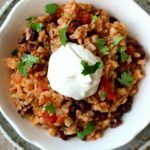 My favorite thing about these Instant Pot Mexican black beans and rice is how fast and easy they are! I can get everything into the pot in less than 5 minutes. I also love the sort of creamy consistency that happens. My favorite thing to do is stir a dollop of full-fat sour cream into my rice. I also love to eat my rice and beans with sliced avocado if I happen to have a ripe avocado laying around. Oh and if you have Juanitas tortilla chips crunch some of them on top. Mmmmm. I made these for dinner last night and I didn’t miss the meat. However if you want you could always serve this dish with a side of chicken. I’m thinking the Cafe Rio chicken would be perfect. For the Instant Pot Mexican Black Beans and Rice I used this Instant Pot IP-LUX60 V3 Programmable Electric Pressure Cooker. It’s 6 quarts, so the same size as most slow cookers. It cost me around $80 on Amazon. When I made a similar recipe in the slow cooker I used this 3 Quart Slow Cooker. The easiest and tastiest rice ever! Brown rice is cooked in flavorful salsa with garlic salt, a bay leaf and cumin. Canned black beans make this recipe very convenient. And my favorite part is a squeeze of lime juice and a dollop of sour cream on top. Make this as a meal or as a side dish. Place rinsed beans, rice, water, salsa, bay leaf, cumin, and garlic salt in the Instant Pot. Cover and make sure valve is on “sealing.” Press the manual button and set to 22 minutes. When the timer beeps let the pot sit for at least 10 minutes and then release any additional pressure. Stir a bit and discard the bay leaf. Add in lime juice and additional salsa to brighten it up, if needed. Scoop into bowls and top with desired toppings. If you wanted you could make this recipe with white rice. Use 3/4 cup white rice and 1 1/4 cup water. This turned out perfect. I had a jar of Trader Joe’s salsa and it was great. I loved it because let’s face it… so easy, no chopping. It was the perfect meal for my teen before fencing or tennis practice. Perfect combo of protein and carbs to power through a sweat session. The thing that surprised me the most- Da Hub doesn’t eat black beans and scarfed down a bowl before a run. WINNER!!!! Thank you so much for sharing this. Nice! I love to hear this. And I love that your kid has fencing practice! How cool is that? This was good. I did add about a 1/2 lb. of ground beef (browned 1st in the Instant Pot), and took another reviewer’s suggestion to cut the cumin to 1/2 tsp. Also added about a 1/2 tsp. of oregano and coriander. Topped it with cilantro, Mexican cheese and more salsa. Twenty-two minutes was the perfect amount of time. Thanks so much for sharing Sharon!! 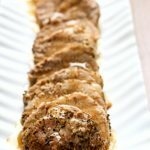 Is this recipe possible to do in a crock pot since I dont have an instapot? I have always added ham to my black beans and rice so I definitely want to try this in my new instant pot. And add some chopped ham so it’s a complete meal. The. I will serve it with some chopped scalli9ns, shredded cheddar cheese and sour cream on top. It looks delicious!!! This turned out fantastic!! Thank you so much! 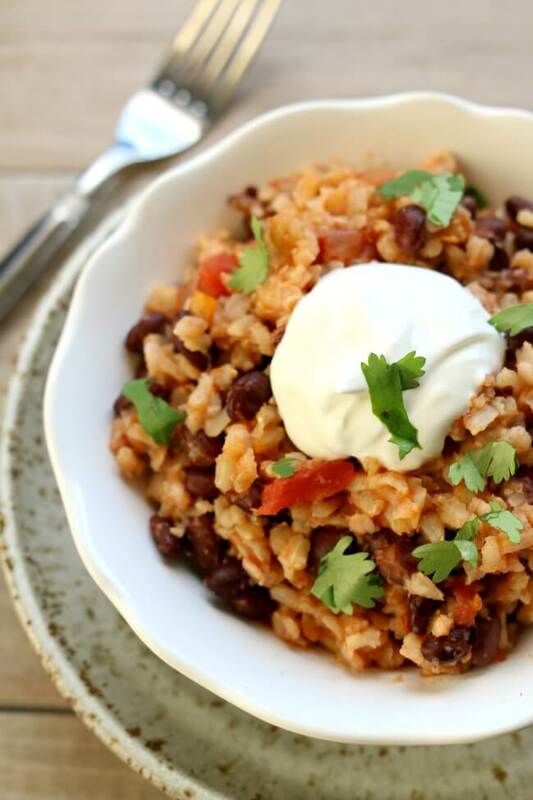 I’ve tried about 5 different instant pot mexican beans & rice recipes and this beats them by a landslide. It’s easier, tastier, and didn’t come out dry (7 no burn signal). For those in the U.S., I used Trader Joe’s brand red Salsa Authentica for the picante sauce. Topped with avocado, grated cheese, cilantro, and a bit more salsa and had tortilla chips on the side for a filling vegetarian meal. I made it but obviously one big mistake I made. I used white rice and cooked 22 minutes. Definitely gummy. Would I reduce time to 15 minutes when using white rice? If it’s long grain white rice I would do a 10 minute time. I just made this for lunch, didn’t change anything, didn’t substitute anything, follow your recipe exactly and it was delicious. thank You !! Just made this last night and it was amazing! I’ve always purchased pre-packaged Spanish rice to go with tacos, but I hated how much sodium and other preservatives were in them. With this recipe, I know exactly what’s in it! I reheated it today for lunch and it was just as good. Very easy to make, and my 11-year-old daughter loved it too. From now on, I don’t even need a taco- I’ll just eat the rice! Doubled the recipe, this made awesome burrito filling, easy and tasty. A man-pleasing recipe that will become a favorite at our house. We will be trying some of your other recipes ASAP! Thank you. Did the cooking time change when you doubled the recipe? Made with white rice and a 3 minute cook time. Cheap, easy, and everybody liked it. 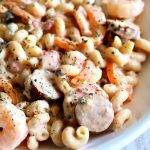 I don’t have an instant pot, could I use a crockpot for this recipe? Hi Karen, I really want to make this recipe, but (from the UK) I don’t know what you mean by ‘picante sauce’. Would be grateful for help. It’s like jarred salsa that is a little runnier than regular salsa. Could I use this as a burrito filling, or would it be too runny? Not too runny. I think it would work well. I browned one pound of burger in the instant pot, drained the grease, then added the rest of the ingredients. It was perfect! Followed the same quantities and cooking times (using salsa instead of the sauce) in a 3qt instant pot and it came out PERFECTLY. This is exactly the dish I was hoping to find, and so incredibly easy. A real keeper! Thanks! Great recipe! I added some fresh corn at the end! Oh fresh corn this time of year is scrumptious! Doubled the recipe, cut the cumin down by half, added ~1tsp each oregano and coriander powder. Served with Doritos, sour cream, green onions, cilantro, lime and shredded cheddar. Delicious and filling! Thank you so much! Hi, First time using the instant pot and I don’t have a “manual” button. What buttons would you press for theMexican black beans and rice? This was so easy and delicious. I doubled the recipe and it turned out perfectly. We used it as a burrito filling. Thanks for the great recipe!!! That is a great idea about the burritos! I have a 3qt IP can I cut the recipe in half ? Recipe sounds great, but I added a little diced onion and pepper (saw someone in the comments also did so with good results), used the variation for white rice, and got a burn signal! I have an 8qt, and maybe it’s just not enough liquid. Recipe is currently cooking on the stove, so I hope it still turns out. I made this last night and followed the instructions exactly. It still had a lot of liquid after following the 22 minutes (using high pressure), and 10 minute wait time. I have another recipe for plain brown rice that calls for 24 minutes on high pressure, so I think this just needs to go for longer time. 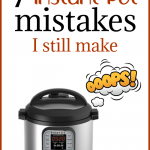 I resealed the Instantpot for a few more minutes, and it was still just okay. Probably won’t make again. I need to triple the recipe for a party of 12. Do I triple all of the ingredients? Also what should the cooking time be? I haven’t tried tripling it but I would probably use 2 1/4 cups brown rice and 3 cups water. Triple all the other ingredients. Same cooking time. Thanks I will do a practice run. Should I do a full release? This is delicious! I doubled the recipe for a family event and it was a huge hit. It doubled just fine with the same cook time and I forgot the bay leaves, but it still came out fantastic. Great recipe! I upped the rice to 1 cup and swapped out the picante sauce for a can of diced tomatoes with Chile’s. Was a big hit! I used another brand of electric pressure pot on the Beans & Rice setting adjusting time to 22 min. It came out perfectly! I used mild picante sauce and will bump that up to the medium version next time. I also plan to double it in the 6-quart pot. I’m currently looking at a 4-qt version of the PP and would not double it in that. This would also make great burritos if one was so inclined. My brown rice did not cook, what did I do wrong, followed the recipe exactly? Really? Was the pot sealed? I had that happen, too, and checked with my mom who made this successfully. She said she cooks hers on high pressure but my IP defaults to low when on manual. One of my new favourites! I scramble a couple of eggs and throw them on top and even eat this for breakfast some days as a ‘hash’. I’ve also taken to putting in a tsp of smoked paprika as well. Thanks for a great dish! Deeeeeelicious!!!! The only thing I did was add chicken. I diced it up into 1/2 inch chunks then seasoned it with blackening seasoning. I sautéed the chicken a bit then just made the rest of the recipe just as you posted. It was fantastic!!! I thought of adding chicken as well for the “complete” meal. Delicious recipe! My family loves it! I did add about a tsp of salt because it was lacking for me. Also, the nutrition info, is that per serving or for the whole batch? Hi Kristen, that’s per serving! Hello, just found this recipe, to looks delicious! I have an Instant Pot not the type you have, so I’m wondering when you say 3/4 cup rice and 1 1/2 cups water, do you mean actual cups or the cup measure that likely came with your multi-cooker that may not be 1 cup/8 oz/237 ml volume? Thanks. I mean an actual cup, not the “rice” cups that come with the pot. Hope this helps! Wow, I Just started using the Instant Pot and this was the first meal that turned out excellent. Great recipe, thank you for sharing. I made this and it came out perfectly! I used beans I had already cooked, and used salsa as it’s all we had. Also, added 1/2 onion at the beginning and some corn after it was done cooking. I used fresh garlic and salt rather than garlic salt. Served with cheddar cheese and lime. Sour cream or creme fraiche would have been a great addition too! Thanks for the great recipe! I’m drooling about creme fraiche! Oh. My. Goodness. This may be my favorite IP recipe so far! Well, it ties for top, anyway! Thank you SO much for sharing, we loved it! Now I will explore the other recipes you’ve posted. Thanks again! So glad you liked it, Lisa! I love this one because it’s so easy. I love it with sour cream on top too! I wanted to make this for a meal, it would be excellent as a side with the recipe as is. But I wanted a little bit more veggies. I chopped up half of an onion and one red bell pepper and a clove of garlic and used the instant pots sautee feature and then added in the rest of the ingredients. I also used red beans in place of black. I think this would be excellent with chicken and would be super easy to add in while you were sauteing the onions Etc. 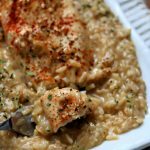 I used calrose rice, one thing I’ve noticed is that it doesn’t take very long in the instant pot, 22 minutes seemed like way too long for me so I lowered the time to 10 minutes and let it sit in extra 10 minutes and that seemed to be perfect. 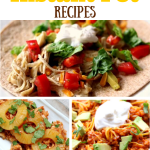 All in all a great versatile recipe that anyone could add or subtract from very easily to their liking, I even think you could add in a cup of regular salsa in place of the picante sauce if you didn’t have any, and it would be just as good. Thanks for this recipe, will be a regular staple! Thanks so much for your observations! What would the best timing be if you use white rice? Hi Rhonda, is it long grain or short grain white rice. Long grain white rice needs only 3 minutes and short grain needs 8. Also the rice to water ratio is 1 to 1.5 cups. Could you not throw some chicken in with this? Just add frozen chicken breasts in at the beginning??? Made this today with some tweaks for dried beans and jasmine rice. Thanks for the inspiration to try it! I used 3/4 cup dried black beans. Either soak the beans or use the instant pot quick soak method (beans + 4 cup water + tsp salt; bring to boil in instant pot; then seal and cook on high for 2 min; quick release, drain, rinse). Followed the recipe for the most part, except I left out the rice in the beginning, cooked for 20 minutes on high, quick released pressure, stirred in 3/4 cup jasmine rice, cooked on high again for 3 minutes, then let pressure naturally release. I also used a can of rotel + one onion diced instead of picante because that was what I had in my pantry. Threw in a diced chipotle in adobo for extra flavor and spice. Perfect one pot meal with stuff from my pantry. Thanks! Can I use precooked/leftover rice for this? Well, the whole point of using the pressure cooker for this recipe is to cook the rice. You could probably just stir the precooked rice and the other ingredients together on the stove until heated through. Could you use a can of chopped/crushed tomatoes instead of salsa? yes, but it won’t have as much flavor. Try using a can of fire roasted tomatoes maybe. Mine has a weird texture, kinda pasty. I used white rice but made the adjustment to the water. Curious. Why it came out this way. Hmmm, I’m not sure why. Do you think the rice was overcooked? Maybe too much water? I had a similar result. Super good in my taco salad, but pasty as well. I’m thinking less time for white rice? Thank you! okay I need to do some testing with the white rice it sounds like! What is picante sauce? Is this different from salsa? 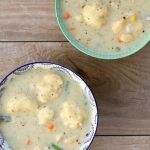 I think I found a new staple in my dinner rotation! Thanks! Very easy and turned out perfectly! I made it to the recipe and it was perfectly cooked. Family loved it, but definitely need to double it, at least, next time. Fed two adults and a teenager as is, no leftovers. Also added some rotisserie chicken to the guys afterwards. Cannot be made eithbjust a simple rice cooker in place of an instant pot? I’m sorry. Are you asking if you could make this in the rice cooker? Came out perfect and I used jasmine rice!!! If I was going to double this, I’d need double everything, Right? Water, salsa, beans, etc. I love how cheap and tasty this is! I added shredded cheddar cheese into it and some sour cream and used tortilla chips to scoop it all up. Awesome! If you were to double or maybe just increase it by half, would it still work in the 6qt instant pot? If you are cooking the dish w/ out salsa in it should you add more liquid and if so, how much? Hi Lindsey, you don’t need extra liquid. Will you be adding salsa after it cooks? Thinking about it but wanted to get sort of a baseline brown rice and beans recipe to have as a go-to. Plus it’s a toss up with salsa and my 4 and 2 year old so I may end up adding salsa to taste after it cooks. Excited to try it tomorrow! Hi! Trying this recipe today, but curious………..where does the lime juice come into play? I don’t see it listed in the instructions. While cooking, or after? Thank you! Oops! I just corrected the recipe. You just add it in at the end after it’s cooked. I assume you can’t use instant brown rice like minute rice? I bet you *could* but I’m not sure what the water to rice ratio would be and the cooking time would be different too! I don’t think it would hurt to just stir them in at the end. The canned worked fine from the beginning though, so it’s up to you. I did stir them in at the end – the dish was delicious! The black beans were my first batch of no soak beans in the pressure cooker and they were just perfect as they were…I was feeling a little protective of them (so silly!) Anyway, the black beans and rice was a big hit with my family, and I’ll need to make a double batch next time so we have leftovers for lunches 🙂 Thanks for sharing the recipe! Oh good! Thanks for sharing, Valerie! I used soaked (dried) black beans instead of canned (1.5 cups) and cooked for 22 min @ high pressure. Turned out perfect. Very tasty! Made it with basmati rice and added corn. I would probably reduce the cook time as it was a little mushy (I did the 22min on high pressure) but was still very good. Thanks! Should I double the cooking time if I need to double the recipe? no, it should be a similar cooking time. Maybe just add 2-3 extra minutes. This sounds delicious! Could it be made with dried black beans instead of canned? You could definitely make the black beans beforehand in the instant pot but I’m not sure how it would work if you added all the stuff together. Acid based foods (like salsa) would prevent the dried black beans from softening so you would not be able to cook the beans with that. Could you make this with dried black beans? Would it take more liquid or more time? I made this with white rice, it only took 15 minutes on manual high pressure. Wasn’t sure how much lime to add but one tablespoon was good. Turned out really good! I’m looking forward to trying this recipe because it looks so yummy! We’re planning a backyard family fiesta this summer and I was wondering if you thought this recipe could be easily tripled or quadrupled in the instant pot? Or perhaps I should double it twice and keep warm in my slow cooker? What would you suggest? Yes, I think you could double it or triple it but I would let the pot do a full release before trying to open.